In the past month or so, our farm has had three great things happen: 1) We were selected as the Wright County Outstanding Conservationists by the Soil & Water Conservation District. Mariénne’s dad, Willard, won this same award 30 years ago, and he’s quite please that it’s come around again. We get to go to the statewide conservation conference in December for a formal ceremony. 2) We’re Organic! 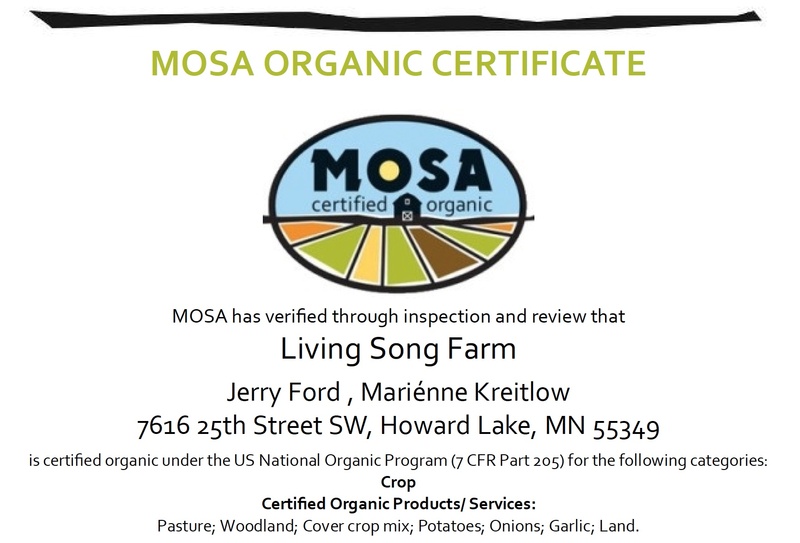 We finally completed all the work and received our organic certification, and we couldn’t be more pleased. 3) Jerry did an interview with the MN Farm Network that seems to be getting some airplay (people keep saying they’ve heard it). There’s a 1-minute version out there, but you can listen to the whole thing here.